A rather small book in terms of the page dimensions, but chunky in terms of it’s depth, the first thing I noticed about this book was that it’s a not really designed to fit on a book shelf. Whether that was the intention of the author or not I’m not sure, as the book itself does lend itself to a fatter, but smaller page. 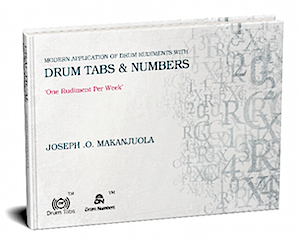 So what is Drum Tabs & Numbers all about? The author has designed the book to be an in depth look at rudiments and applying them to the drum kit in a logical way. He also says you should work from it for three years, which I did slightly raise my eyebrow at. On the premise of 1 rudiment per week, it begins where all rudiment books begin; with the single stroke roll. Starting by playing and working with the left hand before leading right handed and then changing subdivisions, you’re directed to work on each exercise for 450 bars or 20 minutes, whichever comes first. This means for anyone with an understanding of rudiments already, you’d have to be very restrained and practise discipline to stick to that, although that’s no bad thing. Gradually you apply the rudiment to the kit by playing the drums in various orchestrations. This is where the drum numbers come in. Each of the drums has a number (bass drum is 0, snare is 1, small tom is 2 and so on), so the orchestration “2,1,3,4” would be to play the corresponding notes on the small tom, snare drum, mid tom and floor tom, in that order. This is an approach I have used with some young students and special needs students in the past and I can see how this approach might work for some, but I have always felt that exploring these ideas for yourself yields more valuable results than just following a grid with all the possibilities laid out for you. There are also basic grooves which are introduced to facilitate the leading into and out of rudiments, although they are written in TAB. I won’t lie, I dislike TAB. In fact I feel it’s the responsibility of educational books to help introduce and enforce the skill of reading regular music. If the student can cope with reading broken 16th note rhythms (as in the latter stages of the book), simply replacing the bass drum for a number 0 and a snare note for a 1, quite literally in place of a normal note head, seems somewhat pointless when a note head would be no more challenging. I can see what the author is trying to do and it’s not a bad idea. However I do feel that once again, people are trying to overcomplicate things in explanation that are fundamentally very simple. As for taking three years over it; you could stretch it out if you spend the full amount of time on each exercise and on each orchestration and I’m sure that by the end you will be far more comfortable with rudiments on the kit. At the end of last year I was given a pair of books featuring albums from two of Steve White’s bands, Trio Valore and The Family Silver. 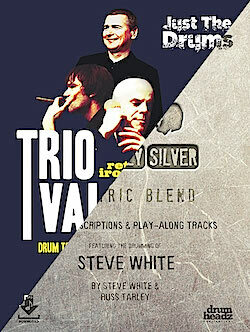 The books feature the full album transcriptions of “Return of the Iron Monkey” and “The Electric Blend” along with downloadable play along tracks. The albums have been painstakingly transcribed note for note by respected Portsmouth based drummer and teacher Russ Tarley from DrumHeadz drum school and a fantastic job he has done as well! With some transcription based books from the bigger publishers, there are often drums alongside the parts for guitar or bass, resulting in more page turns to get through a song which is something I’ve previously expressed my frustration with. Not so in this case as each piece is set out in a nice clear layout, with minimal page text making it very easy to sit down and play through the songs. One nice touch is the intro page to each song which features a picture of Steve playing with the respective bands and a written intro with background on the tracks. The downloading side of things is also very good for a smaller publisher. You create a login account on the DrumHeadz website, enter your password and download the tacks. I did have one slight issue here where it wouldn’t allow me to download all the tracks at once and I had to download them individually. A minor inconvenience really. As for the actual tracks themselves, it sounds as though the music with the Trio Valore book has the drums removed post production of the album; as best as possible anyway. This means you can just about hear the playing of Steve faintly in the mix. Of course, as soon as you start playing yourself you’d be really hard pushed to hear them so that didn’t concern me a great deal. The Family Silver album on the other hand has obviously been mixed from the get go without drums, so no repeat of that issue here. If you’re a fan of Steve’s playing and enjoy a spot of funky sight reading, these two books are well worth checking out and I think a reasonable price at £14.99 each. The whole package has been produced to a very high standard and for those who are perhaps able to read but not overly confident with their ability, the pieces are actually very easy to break down and absorb, due in large part to Steve’s style of drumming; locking into a groove and not overplaying. 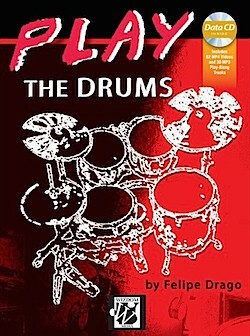 No surprises in this solid release by Felipe Drago via WizDom Media, Play The Drums is a decent starter book for drum kit. Split into four units, it aims to get you playing “real-world beats and fills as quickly as possible” and it does a good job of that too. I really liked some of the theory elements at the start of this book, explaining how notes split down and the relationship between note and rest values. When introducing double strokes and the idea of playing them on both hands and feet, I did wonder if he expected beginner students to have two hi-hat stands as that’s what is written. Originally I thought it was a print error, but it appears throughout the book. If it’s intentional then I think it’s a bit of an oversight on part of the author; I don’t know many experienced players using two fully functioning hi-hat stands, let alone beginners. There is also a multimedia disc included with this book, which contains some simple songs to play along to and video examples of some of the exercises as well. The video examples have a silhouette of a camera next to them, audio tracks have a record (perhaps vinyl is making a return to drum books too) and are all a good quality. Given the way things are going now, the addition of downloadable media would be handy for those of us who’s laptop no longer comes with a disc drive. It’s something more publishers are doing, but unfortunately isn’t available with this release. Overall this is a decent beginner book, introducing the notes form crotchets through to semi-quavers one at a time and gradually developing some good basic skills on the drums.